After finding his older brother's lifeless body, the suicide prompts cathartic changes in a young man. A true story about discovering the importance of humor amongst life's darkest moments. 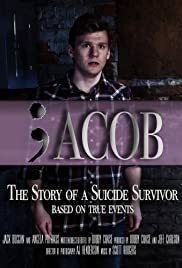 A short film based on real life events that shook a small town and turned a family's world upside down, Jacob illustrates the immediate shock, then darkness and angst, that disturb the minds of those in the aftermath of a suicide. It explores the emotional battle suicide survivors experience throughout the rest of their lives, one of the many unintended consequences of a life-ending decision. Ultimately, Jacob reveals our ability as humans to move on with our pain in a healthy way, inspiring humans to overcome life's darkest realities - oftentimes in the most unexpected ways. This painfully true look at the effect suicidal depression has on the people around the victim, the inspiration that continues to motivate suicide survivors, and the humor invoked to remember the light, even when it seems far away or even non-existent. Take this emotional ride through the eyes of a survivor and dare to make sense of what's left behind in the wake of a young-adult suicide. A story told by the brother of a suicide victim that cleary conveys his pain, anguish and more importantly his thoughts through the whole ordeal. Very moving piece.